Home > Headlines > News > Are Your Tires Winter-Ready? Living in Canada, most of us are far too familiar with how messy winter roads can get. Whether you commute on salted highways or unplowed suburban streets, winter tires are essential for prolonging the life of your vehicle and keeping you safe. Contrary to popular belief, all-season tires just won’t cut it during the winter months. Winter tires do more than keep you from bugging out on snowy roads – they’ll keep your Beetle, Tiguan, or any other vehicle on the right track. Winter tires do this by incorporating rubber compounds developed for added traction at lower temperatures, and by using deeper treads for added grip. Let’s be honest, we’re in Canada, eh? Once temperatures hit 6 degrees celsius, it is important to have winter tires on, even if there isn’t snow on the ground. Winter tires remain softer in cold weather, allowing for traction and control. Volkswagen is known for having market-leading 4MOTION technology, which is a permanent all-wheel drive system exclusive to Volkswagen. This system will keep your traction balanced for you, doing all the work and keeping you safe. Winter tires will do the rest, along with some safe driving from you, of course! To pick the right set of winter tires for you, you’ll first want to analyze how you use your vehicle. Most people use their vehicle to commute to and from work. In this case, a general set of winter tires will be adequate. 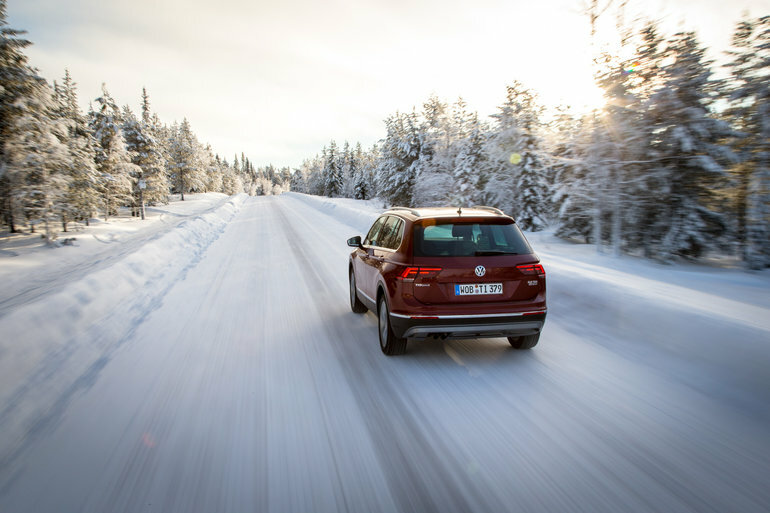 For longer commutes, and heavier family loads like a full Tiguan or Touareg, consider performance-based winter tires. Whatever your situation, our Parts Department can help you select the right tire for your vehicle, and our expert technicians are the key to having your winter tires installed to manufacturer specifications. Winter tires weren’t just designed to leave funky tracks in the snow. They were designed to provide the traction necessary for you to travel across the snow, sleet, ice and extreme cold safely. Winter tires feature a Q-speed rating, which indicates the tire’s allowable range of speeds. This number is generally lower than regular use tires. Cold air also causes tire pressure to decrease. It’s necessary to inspect your air pressure more often during the winter months. The desired air pressure can always be found in the owner’s manual, and our trained technicians can ensure that your tires are at the correct pressure level – just pop into our Service Department for a visit! Trust our expert technicians to use the right tires for your vehicle, and leave your summer tires with us for storage until it’s time to roll your Beetle’s top down and cruise over to Wasaga Beach! Did we mention that many Ontario insurance providers now offer discounts for drivers who purchase and install winter tires? It’s true! For most providers, all you need to do is save your receipts and provide them to your insurance broker. Keep your family safe, your vehicle on the road, and save some cash by having winter tires professionally installed at Crosby Volkswagen. You can also drive your winter-ready Volkswagen into many local merchants for discounts on delicious local dining, getting your nails done, and more with our Crosby Rewards Program! Ask one of our staff for more details or contact us for more info. With fall in full-swing, and temperatures dropping, the first signs of snow could be here sooner than you think. Book your appointment with Crosby Volkswagen today to ensure your vehicle is snow-safe. Call us today at 1-519-894-9300! Crosby Volkswagen makes it easy for you to invest in quality winter tires by offering price-reduced packages and easy convenient booking and installation. Information and prices can be found here.